With the advent of powerful home computers, a new tool is now available to assist in shaping gemstones! Computer programs for generating new gemstone designs have introduced data accuracy into the facet design process. The new faceting machine I constructed, herein described, uses the facet distance data now available in computer generated descriptions of gemstone shapes. The most immediate signs from the influence of computers are the availability of gemstone design programs. These include: GEMCAD, developed by Robert Strickland for the IBM flavored PCs, MAKEGEM developed by Piet G. van Zanten in the Netherlands for AMIGA style PCs, and Fred Van Sant's program MacGem for the Mac enthusiasts. These very powerful CAD programs contain many functional similarities. They all select vertex points and the connecting facet edges. They allow a consistent set of facet angles to be selected or computed. The resulting facets form the correct intersection edges, with their corresponding vertices. In addition, the program DATAVUE, developed by Bob Long and Norm Steele, permits an easy selection and displays a mind-boggling number of accumulated computer facet designs for use on your home computer. One common thread that occurs in all of these computer design methods is the need to position each facet by specifying three numerical values: (1) facet angle, (2) index angle, and (3) the distance of the facet from a selected centerpoint inside the stone. Alternate sets of numbers are used in programs, but they result in an imperfect choice of facet distances. A number of methods to control stone shaping have evolved. The CAM (Center-point Angle Method), and CED (Center-to-Edge Distance), discussed in Robert Long and Norm Steele's early publications, can be used to determine the girdle shape. Meetpoint methods are most effective when one is trying to grind the non-girdle facets. The real difficulty occurs when there are no available meetpoints to help set the distances. Then, only your “calibrated eyeball” is available to know when to stop. Until the arrival of computer generated designs, information on facet distances was not a part of the “recipe” for making the stone shape. They only became a necessary part of the data for stone design during their development on a computer. One of the computer's major design tasks is the determination of these elusive distance values. The most amazing thing is that after all this extra work is done by the computer, these distances are not published in the computer generated facet design “recipes”. Only facet angles and index settings are. Certainly, we all know the reason for this omission. NO faceting machines available to the hobbyist and the small production cutter are built to use the distance data, even if it were available. So, distances are usually not mentioned. 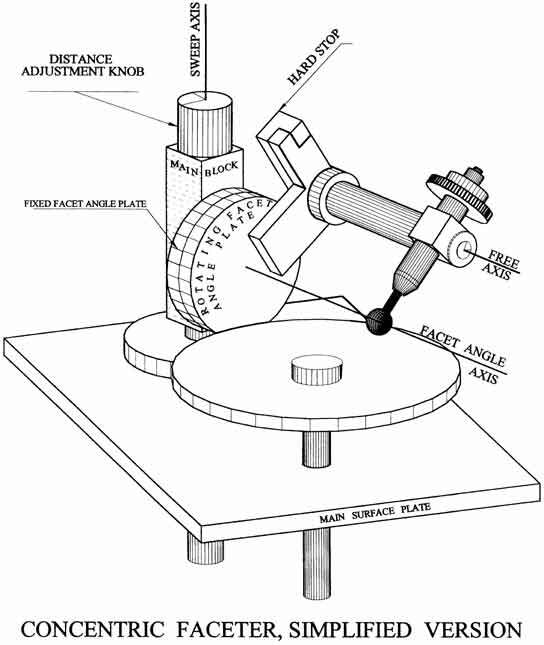 To my knowledge, only Long & Steele's early discussions on how to shape girdles using mast height micrometer controls (available on some of the more fancy faceting machines), and the CED approach provide a method that directly controls the facet distances to the girdle. Here, the common thread is: only the girdle facet distances are easy to determine. The facetor's ability to calculate what distance setting to use on a mast, for all facets, is very difficult, because of the mechanical coupling between facet angle settings and depth settings at the mast. Computing the correct distance settings for facets having angles less than 90 degrees requires very accurate knowledge of this coupling. This problem certainly must have been addressed very carefully on the Jarvi Facetron CNC automatic faceting machine. In 1992 I wrote a 'C' language faceting design program to emulate exactly the problems one finds in the actual cutting process. The only way I could obtain a correct design was to “cut” the facets on the computer in exactly the same way that I would do with a real stone, that is, by changing the facet distance and not the vertex points and facet edges. Only facet angles, index angles, and the facet plane's distance were selectable. The computer would then calculate the corresponding facet edges, including all the minor edges that occur when meetpoints are not perfect. The final result was a rotating display showing the perspective 3D wireframe model of the stone shape. designs, it finally occurred to me, in early 1994, that it would be an interesting problem to develop a faceting machine that could accurately make use of the newly available distance data. The angle/distance - decoupling approach that I used was to simply avoid it, as well as all the numerical fussing required for a conventional mast style machine. I decided to design the basic machine to eliminate any coupling between facet angle settings and distance settings. The basic principle was to fix the facet angle rotational axis to have it always intersecting the stone center point; i.e., the rotational axis must be “concentric” with the stone center. The index angle rotation axis is already intersecting the stone centerpoint (by default), therefore, there is no need to “decouple” index settings from the distance setting mechanism. 1) The vertical free axis shaft for sweeping the stone and dop across the grinding/polishing lap contains sealed and protected ball and thrust bearings positioned below the main surface plate. This 0.875" diameter steel shaft is limited to only rotation about this sweep axis, with the vertical motions constrained by a single thrust ball. The shaft projects about 5 to 6 inches above the main surface plate. It has a precisely bored and fitted main block mounted to it, permitting the independent control of the vertical position of the facet rotational axis with a screw adjustment. 2) The vertical position is measured with a precision 10 mm. dial gage (not shown) reading to 0.01 mm., which is not part of the screw adjustment mechanism. This provides an independent measurement of the vertical position of the main block for stones up to 20 mm. in diameter. The facetor has the capacity to use a longer stroke dial gage (25 mm.) that would cut stones up to 50 mm. in diameter. 3) The facet angle position is measured with a fixed engraved angle plate and a matching 1/20 th degree vernier plate. The angle plate is 4.000" in diameter and 0.5" thick, with the degree markings engraved on the 0.5" edge. The vernier plate is mounted on a matching 4" diameter, 0.5" thick rotating facet angle plate, which supports the remaining boom and index position mechanism and the dop collet mechanism. 4) There is an additional horizontal free float axis, similar to the ones on all mast machines, that allows the dopped stone to be lowered onto a rotating grinding lap. The free axis is constrained in its down direction by a hard stop that holds the stone’s center position on the facet rotational axis. The hard stop provides an electrically isolated contact that is electrically grounded when the horizontal free axis motion is limit-stopped by contact between the fixed and moving parts. This contact closure is used to turn on a high output red LED, located on the main block, that alerts the facetor when the stone center is concentric with the facet angle axis. 5) Backlash-free cheater adjustment devices (not shown) are included to allow small adjustments to the facet angle and index angle settings. The facet angle control needs such a device, because it is almost impossible to manually make a facet angle adjustment fine enough to match the 0.05 degree readability of the vernier setting. 6) The dop is designed to properly control the location of the stone center. It must be set to have the desired center point of the stone, mounted on the dop, concentric with the facet angle axis when it is mounted in the dop holder on the faceting machine. This requires an adjustable collar mounted on the dop, set in a special transfer jig to fix the stone position at the known center distance of the machine. This collar has four centered “v” grooves (with 90 degree spacing) on the face of the collar that mate with corresponding centered “v” ridges on the dop holder. These grooves and ridges provide repeatability in both centering and index position control. It also allows the facetor the luxury of removing the dop for more elaborate examination without loosing any accuracy of positioning. This design is, admittedly, more complicated than the more traditional ones. However, it has position repeatability that is sorely lacking in any other dop-holding scheme that I have ever encountered. 7) The lap drive spindle is de-signed to have the height of the upper surface of any lap at a fixed position relative to the main surface plate. This permits the facetor to effectively ignore the effects of different lap thicknesses when using the micrometer dial gage to set the facet cutting distance. These are the main features built into the “concentric” faceting machine needed for facet cutting control. These features make it possible to cut facets to the desired distance without the geometric problems associated with conventional facet machines. There are other details, not covered here, related to dop transfers, etc., that must be kept under control. Careful attention to centering and lap irregularities make it possible to cut fancy shapes down to the fine grinding (1200 grit) stages with only limited examination for correct depth of cut. One of the most troublesome procedures of shaping the stone for polishing is now made easier using the depth of cut control in a “concentric” style faceting machine. Notice that the ability to use distance data makes it unnecessary to use meetpoint methods to generate the facets of any shape or style stone. However, it is still recommended that the meetpoint cutting sequences be used, as much as possible, to cross check whether the faceting is proceeding down the correct path. It only makes sense to maintain as much control of the procedure as possible. Another nice feature inherent in this type machine is the ability to cut duplicate sized stones because of the direct control of facet distances. The rigid construction, inherent in this style machine because of its compactness, as well as the independence of each function, also makes polishing easier to control. In many of the cases where I have used this machine, I could polish the table without the need for an offset dop holder to limit squealing. This aid is directly attributable to the rigid construction and to the “distance controlled” offset dop holder to quiet this problem. I can be contacted via E-mail at: deaz@buffnet.net, by Snail-Mail at: 310 Chairfactory Road, Elma, N.Y. 14059, or by phone at 716-655-9951. Use the E-mail if possible. I will have a hard copy record, and it is a lot cheaper than a phone call. W.R.D.